The death toll in Turkey’s worst mining accident rose above 300 on Saturday as fire in part of the mine hampered the search and rescue operation. Energy Minister Taner Yildiz said that the toll in Tuesday’s explosion and fire now stood at 301 after more bodies were discovered. 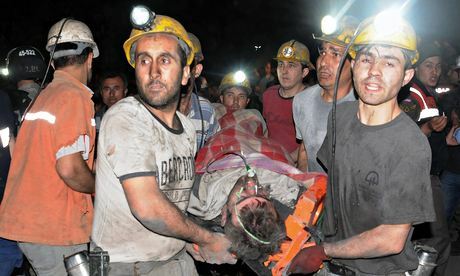 “A total of 485 miners escaped or were rescued from the mine in the western city of Soma. “Efforts were underway to bring fire that broke out at the site, 230 kilometres south of Istanbul, under control,” he said. Report says the mine’s operator, Soma Holding, is facing criticism about safety deficiencies at the mine, but anger was also directed at the government for allegedly allowing lax safety standards to persist. Police used tear gas and water cannon on Friday in Soma to disperse hundreds of protesters who were chanting anti-government slogans. PM Recep Erdogan was accused of slapping a man in the town when he was confronted with an angry crowd of residents. Mining accidents are common in Turkey, although before the Soma explosion, the deadliest occurred at a coal mine in 1992 in Zonguldak, a province on the Black Sea, where about 260 people died.